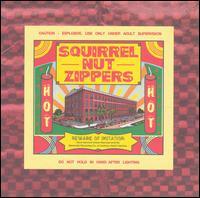 Squirrel Nut Zippers. What a strange band. A band that probably could have only rose to the popularity it did in the 1990s. With the ska and swing revivals in the late 90s, Squirrel Nut Zippers were lumped in with bands like Cherry Poppin' Daddies, the Brian Setzer Orchestra, and Big Bad Voodoo Daddy. However, Squirrel Nut Zippers were different in that they infused Delta blues, klezmer, and calypso, which is heard in the breakdown of "Hell," into their music. They also used old school recording techniques by setting microphones around the recording space and capturing the sound of the band live. The video is great and it harkens back to when music videos and MTV were vital for the promotion of an album. Be on the lookout for the cowbell that the drummer is holding during the "D-A-M-N-A-T-ION" breakdown part of the song.